Any day is a good excuse for more Aphra pictures but it tends to be a really good day when you’ve recently been approved as the first Aphra in the 501st. (I actually got the news during this photoshoot!) Even better… I have a chance to take pictures with my friend and garrisonmate in his Darth Vader! Thank you to Haythem of Lafhaj Studios for all of the rad pictures! There was a lot going on at the shoot and I’m happy that we were able to get these shots especially for the ones that were aiming to recreate panels! Such as, you know, one of the early panels from the first volume of the Darth Vader comic. 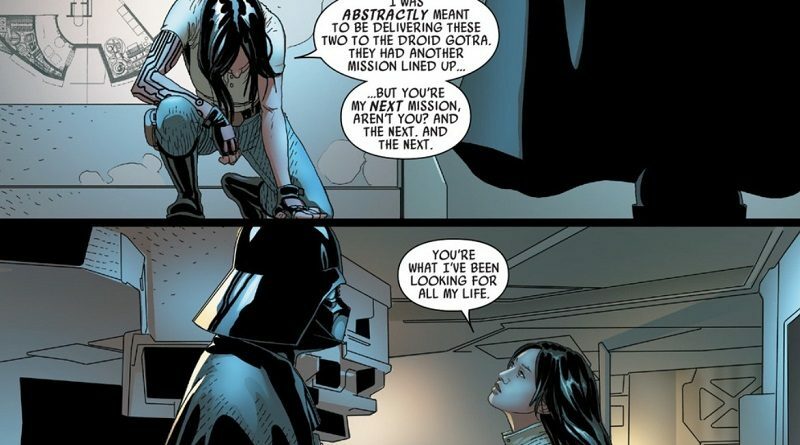 Whatever it is… it wasn’t Aphra’s fault. It’s not a secret how much I love Leia and I can’t help but make new costumes for her all the time now. (It may be the latest obsession.) Ever since I saw her new dress in the Marvel Comics a few years ago, it’s been on my wish list. It’s the perfect blend between her classic Senatorial look and something more fitting with her somewhat more action oriented role in the comics. It may have taken a lot of work combined with plenty of frustration about sewing spandex but it was totally worth it. Shout out to my Alderaanian sister Nicole for being my Evaan Verlaine at Celebration!